Mortgage Applications rose 0.1% last week as purchases fell 3.5% and refis rose 3.1%. Job openings fell in June, according to the JOLTS job openings report. The quits rate was steady at 1.9% and hires was steady as well. The quits rate is an important labor market indicator to the Fed. Chinese weakness has been driving the sell-off in stocks and the rally in bonds. Does it have staying power? Can it affect the Fed’s thinking with interest rates? IMO, the answers are yes and no. The Chinese real estate bubble is deflating – the only question is whether it will be a disorderly mess or whether the government can let the air out slowly. Given the amount of state control over the economy they may be able to engineer a soft landing, but no one else has been able to do it – Japan came close, however they took their debt to GDP ratio to 2.2x and have had to endure 25 years of no growth (and counting) to do it. The punch line however is that China’s economy will slow, and that will depress commodity prices and increase deflationary pressure worldwide. This probably is Treasury bullish at the margin, but it isn’t going to be the driver of Treasury prices – the US recovery and the Fed are. If anything, turmoil in China is going to be a secondary effect. I still think the Fed hikes rates 25 basis points in September and then waits to see what happens. If the economy accelerates, maybe they hike another 25 in December. If the economy flatlines, maybe they wait. Note the Fed has historically been reticent to make big changes in an election year, for fear of being accused of being political. Everyone knows that Dodd-Frank’s limits on market-making has affected liquidity in asset markets. Stocks are already susceptible to air pockets as tight spreads and low commissions have made the market-making business unprofitable. However we are seeing it in other markets as well – gold, currencies, etc.. Citi makes an interesting observation: performance-chasing by professional investors is also exaggerating market moves. They call this a “fundamental change” in the markets. I wonder how much of it is due to ZIRP. If professional investors cannot make a return in buy and hold strategies because interest rates are too low, they have to chase performance. I suspect as rates go up, this dynamic will reverse as professional investors return to classic buy and hold strategies that work. That said, the market-making aspect is a new normal that we need to get used to. 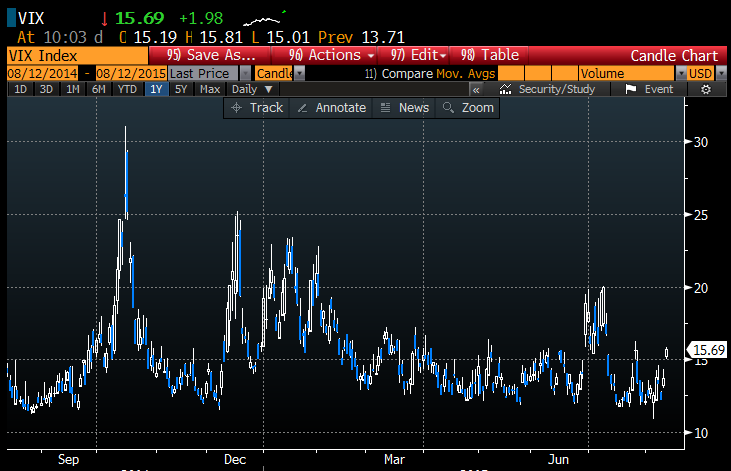 For all the sturm and drang about volatility, the VIX (a measure of fear in the market) is remarkably sanguine at 16. Hillary Clinton gave her server and a thumb drive to the FBI last night under subpoena. Supposedly the IG found top secret messages on her server, so this could (or at least should) potentially be serious, if Obama decides to make it serious. Supposedly the admin was the one who initially leaked the story to the press, so they may treat it seriously. As a former Naval Officer who handled classified material, I know if I had taken home top secret material, I would have been thrown in jail. Also, regardless of what the Obama Administration decides to do, someone has everything that is on that server. If it is someone’s interest to not have Hillary as president, it will get leaked to the press. Donald Trump will discover the truth about what’s really on those email servers! anyone else and we’ve already seen her and her staff led away in cuffs. No cuffs, NoVA, for anyone who did this before it became proscribed. As I understand this, her use was not unusual at the time, until some brainiac IG figured out that private servers were not secure, which was a later development. If Kerry says he treats State’s servers as if they are being monitored by unfriendlies, we can only hope HRC did, too, including at home. But if those were sensitive memos in plain view, so to speak, SH-T. Indeed. Hard to imagine that she remains a viable candidate for office. I wonder just how much it would take before D’s refused to vote for her. I wonder just much D voters are willing to take before they can no longer stomach voting for such people. Oh yes it was. And by design. JNC, what about Powell’s use of private email? Supposedly there were others, too. And is it not your understanding that this was not illegal at the time? that IG letter is good enough for an arrest warrant for me. Trey Gowdey pointed out that most normal people delete emails all the time. If an email is no longer relevant or is a nuisance, you delete it and no longer see it. You don’t wipe the server it is on. The only reason you do that is to cover your tracks. I’ll say it again, there are no secrets between governments. What secrets That exist are known w-in six months. Information is used as leverage and it doesn’t take long to figure out when it’s been comprised. The only thing hidden is information from citizens. I don’t believe that Powell built his own server infrastructure. I think he used a third party. What HRC did is closer to the Karl Rove E-mail scandal. She wanted the ability to have complete control over what was kept and what was provided to any potential future investigation.